Keeping up with upkeep , with so much tatting around ?! A Herculean task. That is why the Pinterest Challenge is my ticket to keep at it, albeit at a monthly snail’s pace. This pin has been on my DIY board for nearly 2 years now. It is among my most re-pinned images. It was finally time to roll up my sleeves & get to work. Quickly mixed up some vegetable (cooking) oil & vinegar (3:1), gave the jar a shake – it is an emulsion & sat down with a kitchen towel (the fiber roll type). That’s all one needs! Applied the emulsion with the towel & left it in sunshine (for better absorption). That’s it! Didn’t even rub it in. I’m sure if I do this regularly, it will get back all it’s original beauty. With a single application, there has been a marked change. With a few more applications spread over the next few months, the spots should disappear completely. TIP : I might even mix in some coffee powder to add colour! This was my challenge completed. But the upkeep wasn’t over. The brass needs to be polished, too! 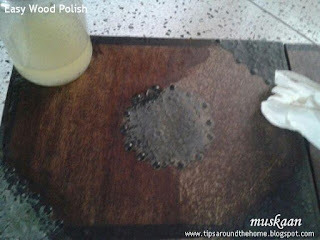 Simple tamarind paste as brass polish ! Materials : Tamarind Paste/pulp , toothbrush, rag, & water. 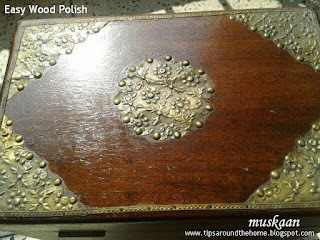 I had a few ideas in mind besides Brasso, which I do not like much (this branded brass polish does make the item shine but for a very short duration; and it is all chemical). For vases, etc. I use tamarind pulp. I tried store-bought salted tamarind paste (Dabur Homemade) . 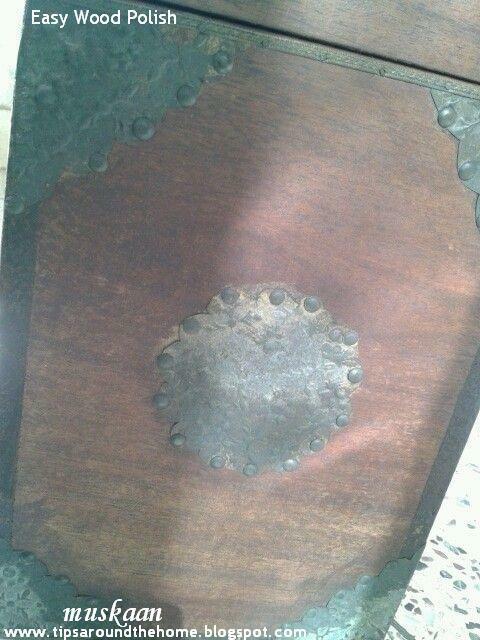 The paste worked quickly on the least affected brass parts. In the step 2 (top right) of process pic above, I have tried to show 3 areas within the same brass circle for comparison : (in counterclockwise direction) before any application of paste ; with tamarind paste ; paste applied & wiped off. The most difficult was the left side again. All that build-up took me many repeats before I realized that if a few drops of water are added after brushing, it wiped away the gunk easily. Repeat application, brushing, adding water, wiping for as many times as required. I think the before/after pics speak for themselves. TIP : Lemon wedges & citric acid crystals (with a few drops of water) were the other two materials I tried this time. The results are inconclusive – they would work for regular cleaning & polishing, not for old & hard build-ups. I intend to scrub some areas regularly whenever I have a few leftover lemon slices. With a bit more elbow grease & time, I could’ve done a better sparkling job. But my intention was to start with the upkeep & keep it up in future rather than tire myself out into distaste. I am very satisfied & motivated to regularly maintain the maintenance of this box ! So I’ve moved from the bedroom to the kitchen to now the bathroom. What next ?! Suzanne, Margaret, Carollyn, & Alma . 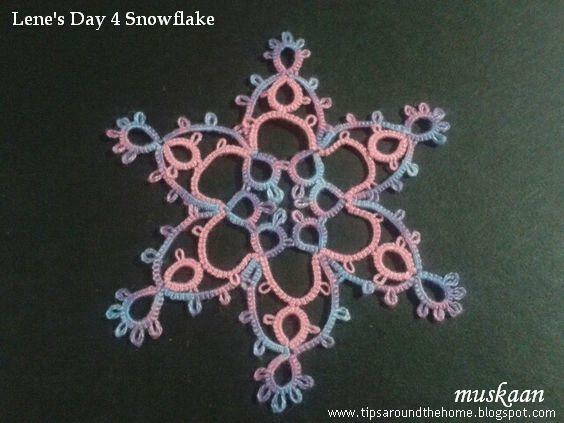 There’s nothing much to write about these snowflakes, except for my colour adventure in one & my split chain practice in the other. Measurements : Rnd 1 - 1.5" ; Rnd 2 - under 3"
Rnd 2 continued clockwise after a Reverse Join to switch shuttles. Added very small anchoring picots to a couple of outer Floating rings to stabilize, then discontinued. LHPJ to link outer chains. TIP : Elaine Gan's Reverse Join enables one to lock join to a point below the working element while simultaneously enabling the switching of shuttles, which is what I needed in order to change the colours. 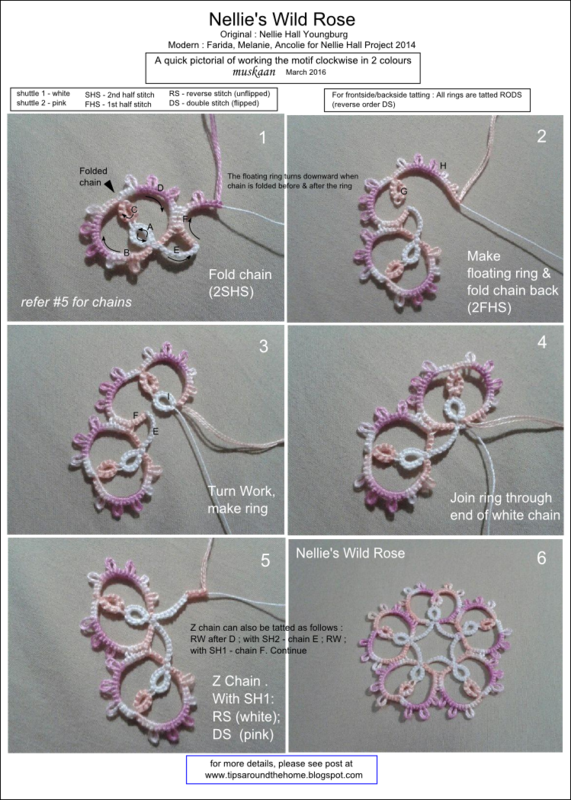 Techniques : 2 shuttles, directional tatting, lock join, split chain (SCh). 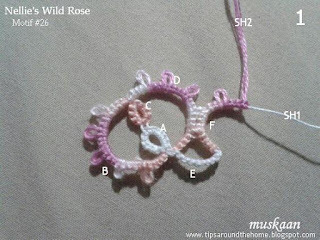 Started rings in Round 1 with RODS (reverse order DS) so that the chains would be normal stitches. Climbed out of the round with a split chain. Deliberately done in single colour because I wanted to practice SCh. I want to become comfortable working the SCh. TIP : During the Craftree Mystery TAL, I realized that after a chain is lock joined to a picot & returns back up for another picot join, the adjacent chains lie flatter together if 1 half stitch is reduced. Or in other words, if the LJ is considered as a half stitch in the stitch count. 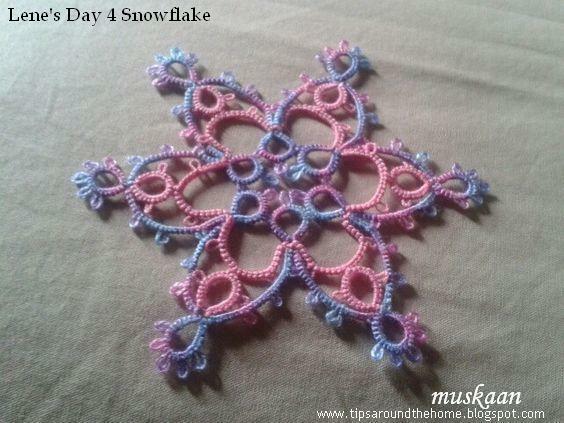 Lene’s snowflakes are much larger than I used to think before, and I’m glad I chose size 40 to work them. 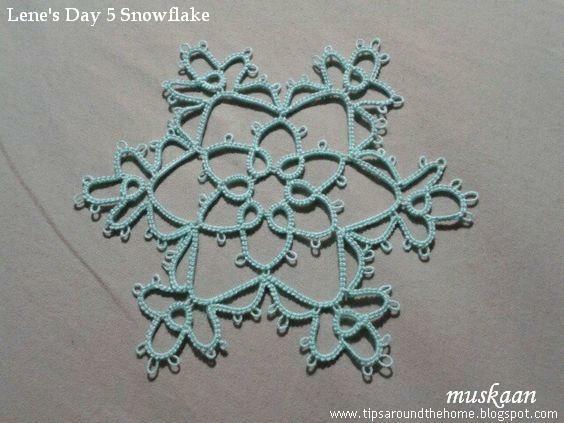 But each pattern has something new to learn or try out, besides being so beautifully designed. I'm still behind by 2 snowflakes but hope to catch up soon. And I've skipped Day 3 for the present. Want to work on it at leisure. It may be a bit early for the Wild Rose to bloom but flowers always bring a happy smile. 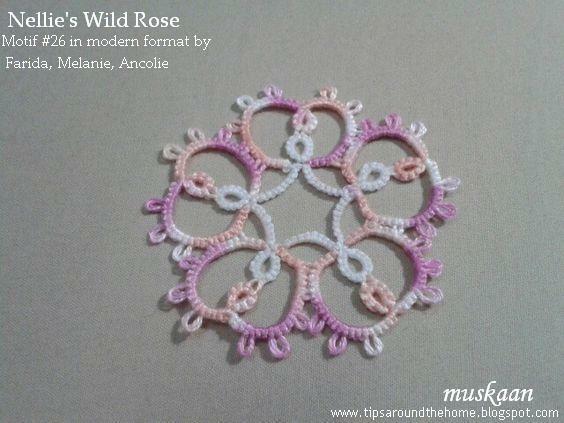 Continuing from my last post here is Nellie’s Wild Rose. 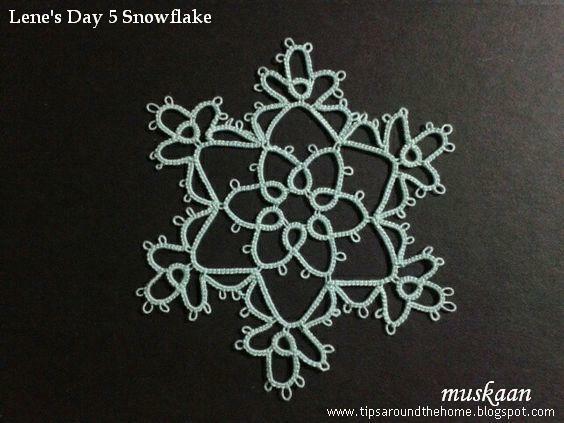 This is Motif #26 from “Forty Original Designs in Tatting” by Nellie Hall Youngburg rewritten & model tatted by Farida, Melanie, & Ancolie for the Nellie Hall Project (2014). The tatted models shared by them inspired me to try this flower. I like the heart-shaped petals – a very pleasing minimalistic pattern. 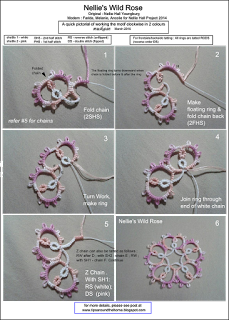 Techniques I used : Fs/bs tatting (optional), Z chain, decorative picots (graduated) , folded chain , Turn work, Down join, Lock Join, RS (optional), joining in a circle. It seemed like a simple pattern at first glance. Well, first glances can often deceive. My first attempt (which was all variegated) landed in the compost heap & I started afresh with a white center to resemble the Alberta wild rose or a Nootka rose. Insights from the first trial helped me. The main steps are collaged together. But here I share each step. Refer to pattern pdf for stitchcount, & pictorial for steps & directions. For convenience, I am uploading single pics sans directions. 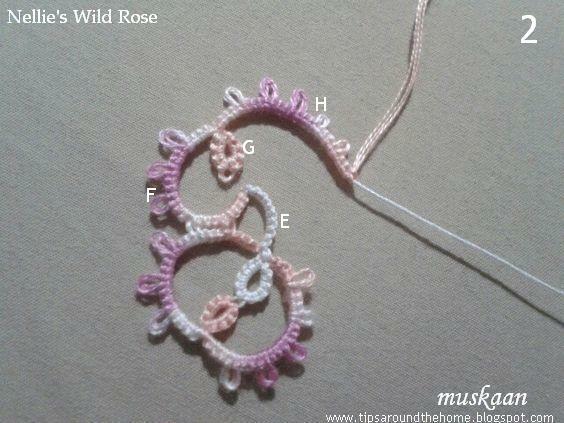 This is merely an alternate way of tatting the rose in clockwise direction. Fs/bs tatting (using RODS) is optional & can be ignored. Chain B : DS with graduated picots. End with 2SHS to fold chain. SS. SH2 : Floating Ring C : RODS . SS. SH1 : Chain D : 2FHS then follow the chain DS . Join at base of Ring A.
Folding the chain makes the floating ring automatically face downwards (one may need to adjust with fingers) without using any other technique, while simultaneously creating a nice little notch. Chain F : DS. Fold with 2SHS . SS. After Chain D, Lock Join to base of Ring A, reverse work (RW) , SS, tat E (RODS) using SH2, RW, SS, tat F using SH1, SS. SH2 : Floating Ring G : RODS . SS. SH1 : Chain H : Fold Chain with 2FHS, complete chain, TW. SH1: Ring I : RODS. LJ to angle of Z Chain E-F.
Repeat till 5 petals are tatted, joining back to 1st petal. What I shared is nothing out of the ordinary. It is only my way of keeping track of what I have done. Spring heralds activity in all living forms. Sharing some happy life here ... Two patterns are from Georgia’s Nellie Hall Project (2014) where volunteers have rewritten/converted Nellie’s motifs into modern format and one is Jane Eborall’s latest flower motif where she went crazy trying to name it. This was intended as a composite post of 3 patterns, but length dictates that I save at least one for the next post. After all, we are only just opening our doors to lovely spring ! 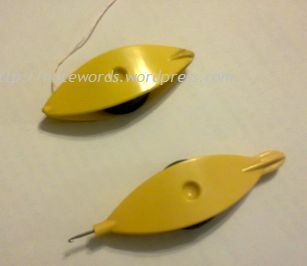 Detailed pattern instructions and diagrams are provided to suit tatter preference . I decided to use a single colour & tat it in one pass. Since this was in one pass, I started with Ring K & went in anti-clockwise direction to complete the 1st wing by joining J to base of K & proceeding with ring aa to tat the tail portion, working my way to the head, with a black seed bead for the eye. The last part of head is a SCh to bridge the distance, then continued with the 2nd wing. 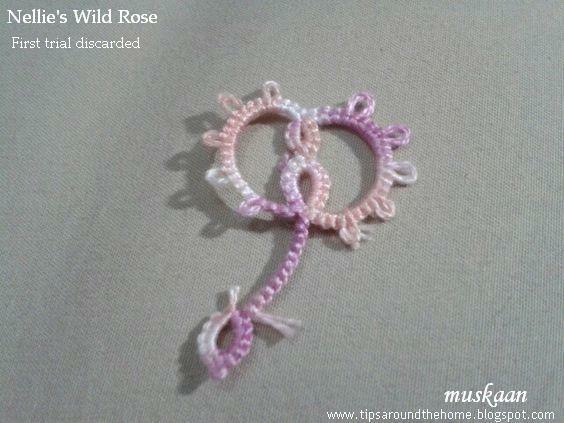 Some of the rings in this pattern can be tatted as SCMRs, including the rings at the tips of tail & wings. Ring aa is exactly as stated in the text (5-5-5) with only 2 picots. Ring jj is linked to the aa picot closest to it; then chain kk; Ring ll is again linked to that same aa picot; thus 1 picot is “shared” by 3 rings (this is sometimes shown as a triangle in some diagrams). Continue working Ring ll & join to the only free picot of Ring aa. Thus both picots of aa have been linked – one shared by jj & ll, & one by ll only. Remember to switch shuttles when working the floating rings & switch back when continuing with the chain. A few picots are drawn extra in some diagrams; follow the written text in such cases. As it neared completion, I decided to continue with the 2nd wing (as in original motif). It was only then that I noticed the 2nd large central rings in original pattern diagram. These could’ve been worked as SCMRs, too. To continue with 2nd wing in one pass, chain vv was tatted as a SCh from the 4th picot point. Continued with ring ‘x’ as an SCMR to which the large central ring A was tatted after leaving a mock picot space. I decreased the chain stitches by 2DS on both ends between rings. Instead of sewing in the ends, I continued with a LCh for a bit, but being the same colour, I have hidden it with beads to make a hanging ornament. 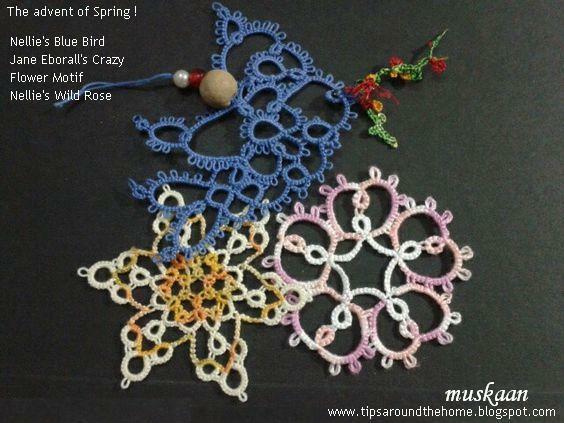 The bird needed a dash of Spring colour to woo his mate & taking a cue from Wally’s cute flower, I went freeform. Materials : Silk/rayon threads (2 strands each) in red, chrome yellow, & variegated green. 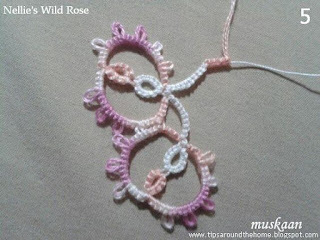 Techniques : 4 shuttles, Pearl tatting, Josephine rings, half-closed rings, long picots, floating/thrown dots, bullion knot. 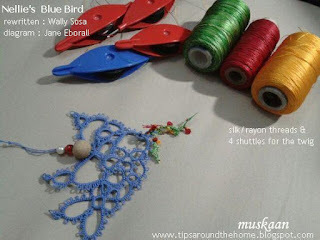 2 shuttles were loaded with green thread CTM. I made one stitch, then joined in the red & yellow threads through their loops (doubled up threads), thus freeing myself from the prospect of hiding tails at this end completely! red & yellow flowers are a mix of Josephine rings, dots, bullion knot, and one dot with long picots that were cut later to represent a flower in bloom (actually the thread broke at this point & it was my way of attaching new thread without having to hide ends). What was I thinking, tatting those teeny tiny rings with fine thread ?! I could barely see the rings in the center. Oh, but as the flower came together, it all looked so pretty & worth it. A fun tat & finished in one evening. As usual, the motif lay flat ! Tatted in one pass without any cuts, ties & hiding until the very end. In order to keep the SCh chain colour same in both halves, I made a kind of loose SLT with SH1, thus bringing SH2 in position to make the split chain. This was easier than trying to encapsulate SH1 thread within the SCh segment. While writing this post, I remembered some tutorial where colour positioning was an issue & scrolled through my pinterest board. Voila there it was. 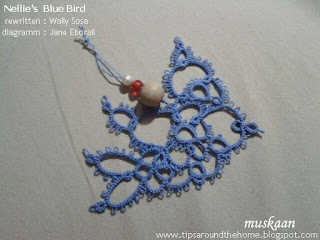 Tatting Chic’s solution to a single colour SCh though one is working with 2 colours. Very clear pictorial. What we familiarly call the Split Chain was Dora Young’s Knotless Technique or Dora Young Knot (DYK). Just goes to show it is so essential to read all one can. I had read & pinned this SLT trick over a year back, and it stayed somewhere at the back of my mind, which probably came to the fore here (you never know what will stick ;-p). Round 2 was continued with SH2, and instead of RW after SR1 & SR2, I simply made a 1RS chain (unflipped stitch) like Frivole had explained in detail recently. Check out the doily Jane made with these flower motifs. Her patterns are always a learning experience ! Hope you have lots of cheerful colours & pleasant chirping in days to come . 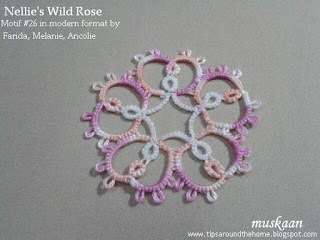 In the next post I will share a short pictorial on how I tatted Nellie's Wild Rose. Thanks to all mentioned for sharing these lovely patterns with us ! Threads : When trying out something new, I prefer size 20 thread. Metallic wire/thread in copper & silver. Celtic Knotted Picots (CKP), Split Rings, picot gauge for CKP, Catherine Wheel Joins, S-Chain, S-Chain with picots. One can climb out from inner circle with a SR or a double core SSSR, but this time I followed the simple route of cut & tie. I love the use of CKP – a lacy way to cover negative space, and join 3 elements together ! When not adjusted/opened, the outer CKPs produce a single-picot angled effect which can be used creatively in an ensuing round ! TIP : While making the CKPs, in order to hold each loop in place, I had cut out little card stock picot gauges that I left inserted till joining was required (forgot to take pics). Since the CKPs needed to be blocked, in order to keep them open, I inserted spacer pins. These weighed down the medallion & made a Lovely carousel. Photograph does not do justice to the fun transformation. TIP : One can add beads to the CKPs or chains of beads all around to weigh down the medallion; add findings above & Voila, one has a jhumka earring ! Or use as decorative tree ornament. The outer CKPs definitely called for blocking before I could proceed further. And this time, a rolling pin would not work, since each loop had to be opened & pinned individually ! I didn’t have a bangle of required diameter & was too lazy to look for a substitute. Instead I tied 2 metallic wire threads, joined them to one CKP loop & tatted an S-chain of 10 stitches, 1ds in next CKP loop, 1picot, 1ds in next loop of same CKP. Continue. 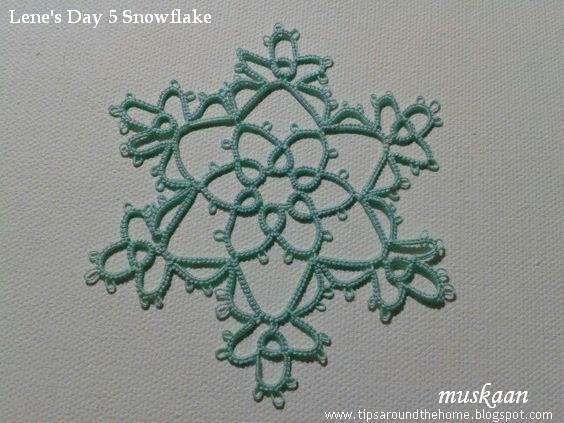 To finish off, I continued with an S-chain with picots between spaced-out stitches. This can hopefully be used as a tree ornament. TIP : The stitch count was arrived at by marking the distance between CKPs on a paper & drawing a straight line between them since I wanted a hexagon. After 3 sides were tatted, I panicked, thinking that the hexagon sides were too tight. So 2 sides on the left have 12 stitches in the S-chain, hence the curvature. What I don’t like is that the weaving overlap of outer CKP loops is not clearly visible. Maybe another stitch would help separate the loops ? 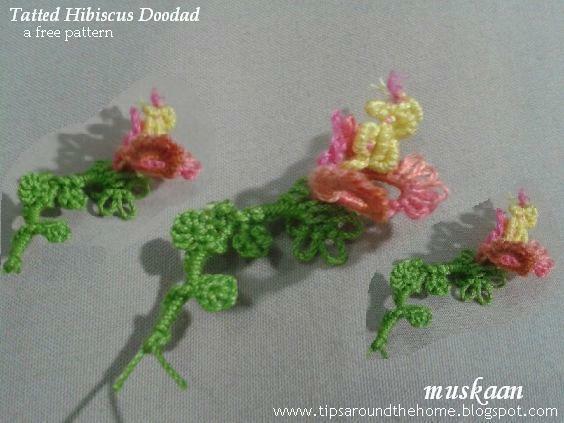 Before using the S chain with picots, I did a quick trial with the metallic wires. The first part (on left) has closely snugged stitches, while the latter half has stitches pulled apart by the distance of each picot. This gives a mock Pearl Tatting effect, using only 2 threads. I really enjoyed tatting this little medallion - worked in just one sitting - & converting it into a hexagon. Love the Celtic Knotted Picots – both for their effect and their multi-utility. They are a bit fiddly, though, & I may be wary of using them with size 40 thread. But who knows what lies beyond the horizon, in the vast galaxy ! 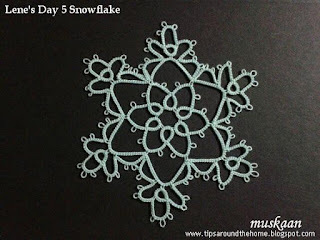 Thanks to Patricia for her lovely pattern and don’t miss her delightful allegorical tutorial of the Catherine Wheel Join here. Bored with the same old chains ? Looking for some new chain effects ? Stumped or can't remember which chain is which? Fall in line but don't yank my chain ! I fell. I fell hook, line & sinker. Elgiva threw me the hook, Sharon followed a persuasive line, & Susan got the concept to sink in ! Looking back I have already used many chain effects in my various patterns (some without knowing the names), yet I keep getting confused when a term crops up & I have to hunt down the tutorial. Hence a sampler reference , along with stitch notations of how it is worked seemed like a good starting point. I share it here, as a pdf for anyone who is interested. In case of any omissions of errors, please let me know so that it can be rectified post haste. 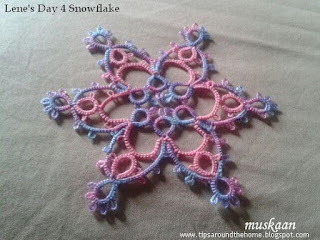 All tatting is done using Anchor Mercer Crochet Cotton in size 20. Thread size, brand, & tatter’s own tension can bring in individual differences. Hence the sampler is indicative only. There has been some confusion regarding the working of a Bullion knot. 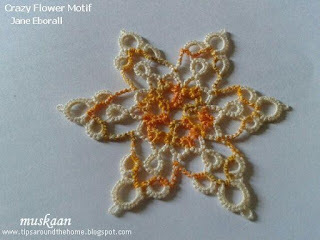 For starters, please refer to any Roll Tatting tutorial. A bullion knot is a small roll-tatted ring, without any stitches, and a limited number of wraps/rolls. It is started like a ring, with thread around the hand; but instead of making DS, one simply starts to wrap the shuttle thread around the thread on hand, & transferring these to the core/shuttle thread. I do this simultaneously : wrap by taking shuttle through loop front to back & in same fluid motion tensioning the thread around left hand so that the wrap gets transferred to core thread. I don’t wait to wrap a few times then transfer or snug. But this is an individual choice (I don’t even add DS in my roll-tatted rings & chains). After about 10 wraps maximum (depending on requirements & thread size), close the ring carefully. Depending on the extent of closure, the bullion knot can look like #15 or #16 above. I used #15 style in my Hibiscus Doodad here. This knot takes some practice; if pulled too tight, it will distort or create bare thread spaces; if wrapped too tight, the ring won't close easily. MaryM's Original Daisy Bullion Edging. This is how a bullion knot looks. 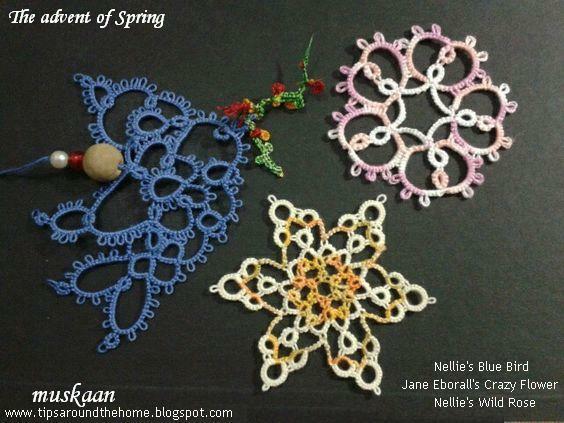 It is a cro-tatted edging & she has crocheted the bullion segment. Ruth Perry’s Bullion Stitch Cross. This is an excellent effect with many possibilities. However, it is not a ‘true’ bullion knot (going by even embroidery & crochet terminology). Along the length of the taut thread(s), a half stitch is being wrapped in the manner of an encapsulated Josephine chain (refer to #24 but instead of complete stitches, only unflipped half stitch is wrapped). It is a form of Dora Young’s knotless bridging/split chain. i) #29 & 30 - Include the term ‘Floating Chains’ for Curlicues – please add it if you download/print. ii) Sampler #24 has been glued incorrectly, The caps of stitches in the encapsulated chain should be facing downward. iii) #27 & 28. Please note that the core threads are different. 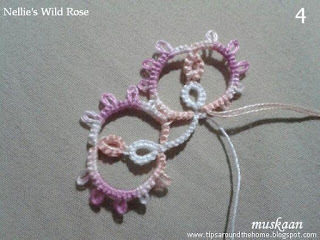 There are limitations to this sampler – coils & rosettes are not included ; braids with complete rings are not included ; no decorative picots or elements are added ; mainly straight-line chains have been lined up. 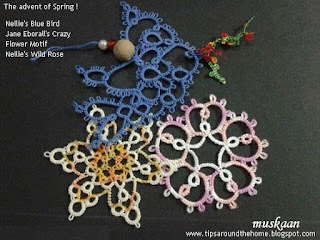 Chains in Shuttle Tatting : This pdf contains 4 pages - p1 & p2 with 30 samplers & stitch-count; p3 with glossary, notes & resource links; p4 with images of chains applied to tatting - both in 2D & 3D patterns. The list is a compilation but by no means exhaustive. It is a point in time & the line will continue to evolve. Each chain has it’s unique characteristics & applicability. It is a journey of discovery. It is also a good exercise down the line from beginners to designers. Last night, after 2-3 days sans tatting, my fingers itched. And I went back to my comfort zone of free-form 3D. It is an original practice piece to study a few techniques which were being discussed in the Design Class last morning. While trying out the bullion knot, the bunched-up knots reminded me of Hibiscus pistils, which led to this 3D flower. Yet another path to pattern designing ! 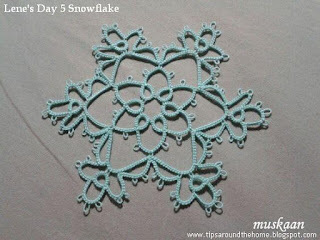 I wanted to take full pleasure in tatting, hence did not jot down exact stitch-count. What I share below is as close an approximation as I remember. It does, however, follow my design objective of off-center, in the petals. This is a good shuttle-emptier doodle. 2 Shuttles, scrap threads (size 20). 3 strands of Anchor variegated embroidery cotton (1315 - peachy) ; Anchor size 20 Art 4054 (0293 lemony yellow , 0256 Mehandi Green) . Join the peach & yellow threads. It is not essential to hide ends. With Peach, make 3 rings-only petals of different sizes & joined irregularly. R1 : 3ds, vsp, 5 graduated picots sep by 1ds, vsp, 5ds. R2 : 5ds, join to R1, 2ds, 7 graduated picots sep by 1ds, 2ds, vsp, 7ds. R3 : 7ds, join to R2, 2ds, 8 graduated picots sep by 1ds, 2ds, join to R1, 3ds. 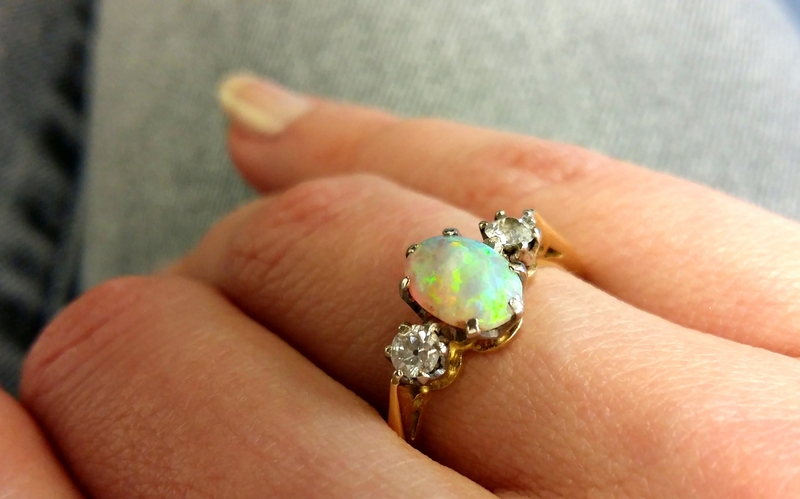 Before closing last ring, make sure both shuttles are on the top side of the petals, in order to make the pistil. JCh to desired length. At random points, make Bullion knots of 10 wraps with SH2 (yellow). Do not close the knot completely. After 5 or 6 knots, & desired length reached, tie both threads together, leave a short length & cut. Then fray the tails. Join green thread (wound CTM) to base of flower. 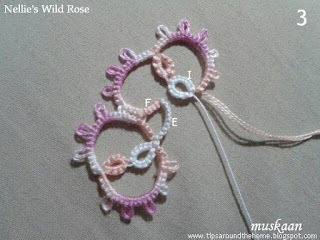 Ring : [1ds, p]x10, curl through any middle picot. 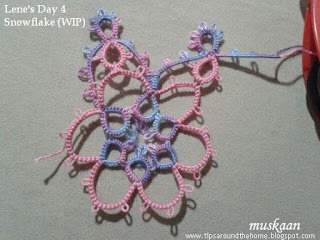 Continue with Josephine Chain, encapsulating any tail threads from the beginning of the flower & pistil, randomly placing leaves along the length. JR : 8 half stitch, close. Continue with stem for a bit. Tie ends & cut & hide. 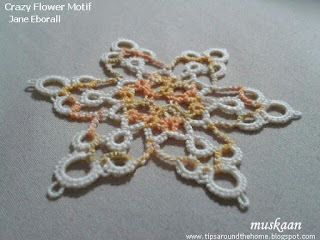 Bullion knots are basically small rings of Roll tatting, in formation. In hand embroidery, what French Knot is to Bullion Stitch ; in tatting, Bullion Knot is to Roll Tatted ring (which is usually larger). A tatted bullion knot looks very similar to an embroidered bullion stitch, where instead of a needle, the thread is wrapped around the core/shuttle thread. 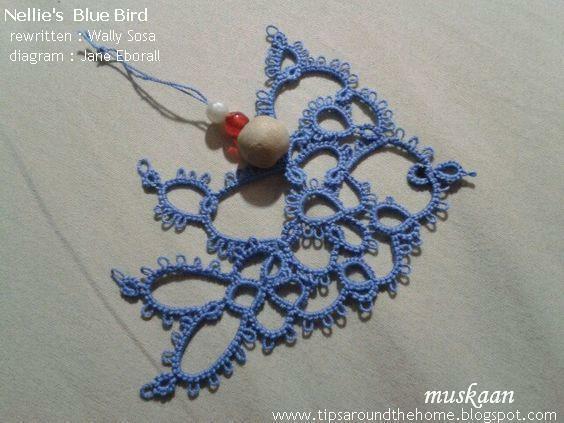 To compare within tatting, Bullion Knot is similar to Half-closed ring or Scallop to look at, but with wrapped thread rather than stitches. 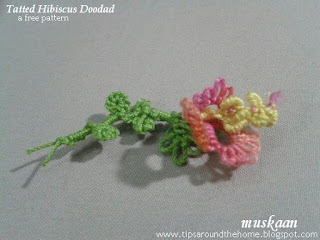 Segment H in I Love Tatting doodle was a long line of bullion knots which twisted on itself. I used the latter in my NeoVintage Heart. TIP : Following a tip shared by Patty Dowden in Craftree, I no longer add a DS at the start or end of a roll tatted element. 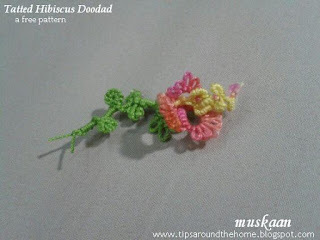 I believe a DS is not a definitive part of roll tatting ; it is merely a means to ease the closing of a ring or perhaps to add a picot. 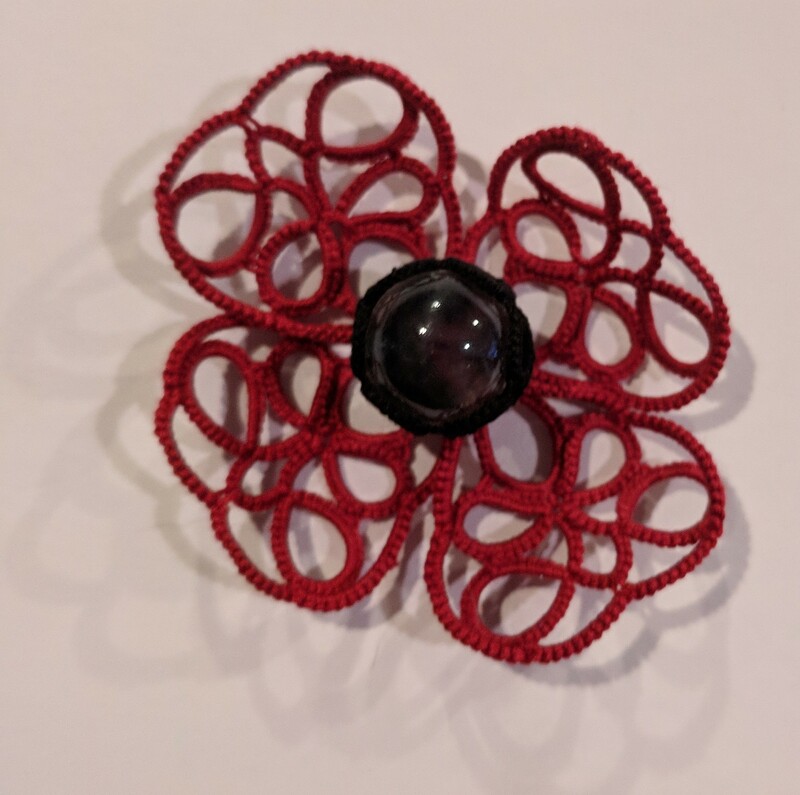 I have used DS-free roll tatting chains in my Tiny Heart Poppy petals. Dots are regular rings with complete stitches, but small in size. The DS is limited to 4 or 5, & when closed, the rings appear as ‘dots’. 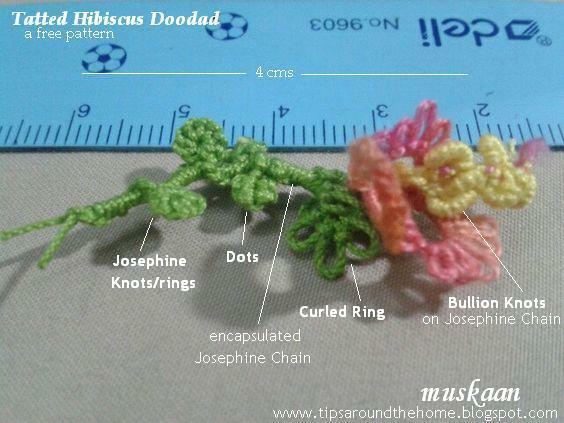 When the dots are made of only half stitches, not complete DS, then it becomes a Josephine knot/ring. Dots of 4DS turned out to be smaller than a JR of 8hs ! 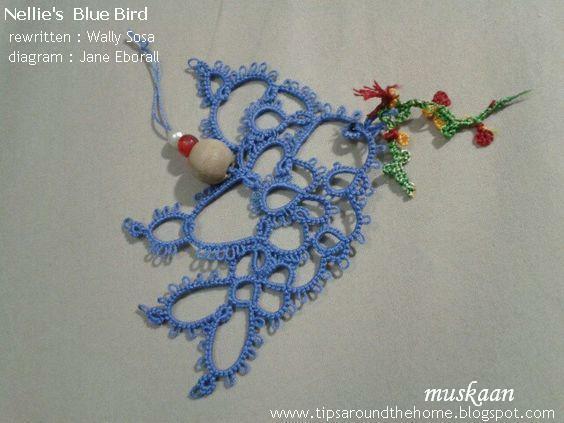 Bullion knots can be closed tightly or one can leave some bare thread space (as in scallops). This will alter the visual effect. If closed completely, these are the smallest in size.